Four years ago I promised my high school friend, Lilian Tsi, that I would run Bay to Breakers with her. Lilian after the shock of a mild stroke four years ago had begun running and this race was a major goal. B2B, as the locals call it, was one of those iconic races that had been on my bucket list of races to do for many years. So when Lilian signed up earlier this year I decided to put my feet where my mouth was. Paul, the serial racer, was initially undecided but after some research concluded that this 103-year old race was more than just people running in fancy dress. A race where Ryan Hall comes second is the real deal. This was an opportunity not just to do a race together in a city I loved and Paul had never visited but also to catch up with friends and family. Arriving late Thursday gave plenty of time to check out the course (shown here on video). The final 3.5 miles passes through Golden Gate Park and Lilian’s place was barely two minutes away. Paul ran there again on Saturday so as to get a good feel for the downhill over the closing few miles and stake out the short finishing straight. Golden Gate Park, like Central Park in New York, is a green lung in the middle of a city. But unlike Central Park, running on the trails in Golden Gate Park you do feel like you are in the middle of nature. Instead of manicured lawns, wildflowers line the path. At the race expo on Friday afternoon we picked up our numbers. Paul was much relieved to find that his bib number of 8059, which he had located on the race website the night before, did not mean he had 8000 runners in front of him. Instead he was seeded and would be sharing a corral with a few dozen elites and a few hundred fellow seeds. Paul may dislike the class system but likes seeding. At the expo, through some sleuthing, we determined that last year’s first two masters’ runners were entered. And thanks to images care of Google Paul would be able to recognize them. Tiger mum and her son at the start of the race. Wandering around the expo we came across some signs that this was to be a colorful race. There were the many vendors selling various types of waist bags and freebie race snacks. But then there was a stall selling brightly colored tutus. 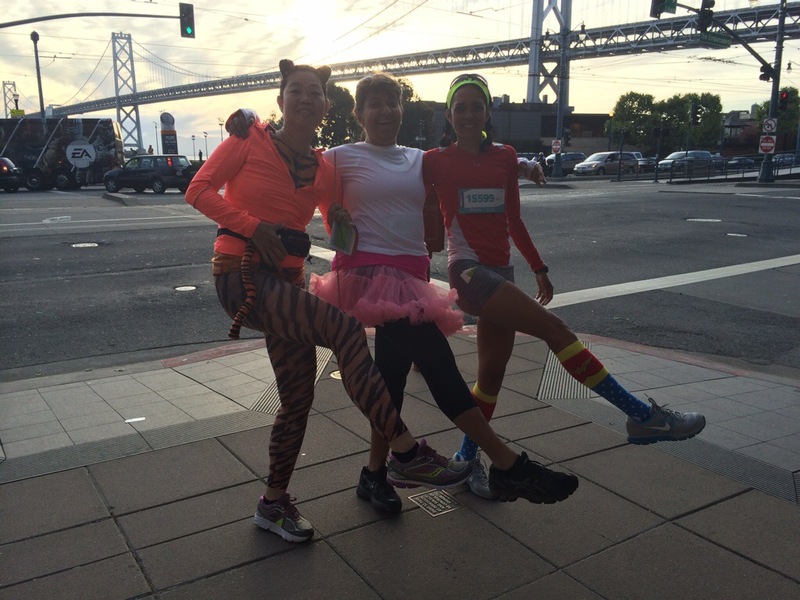 During the race we would discover that tutus were a dime a dozen. As were naked runners and superheroes. 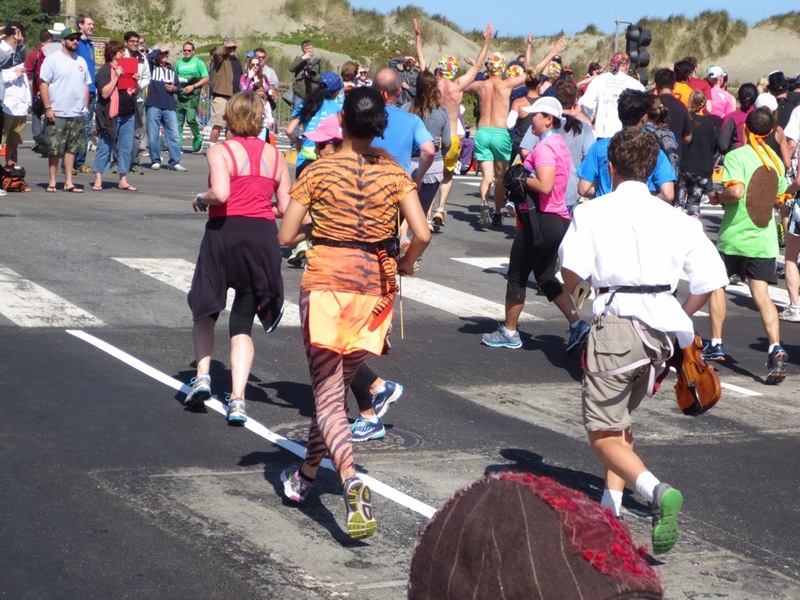 Lilian and her son, Peter, were going to embrace the spirit of this race, dressing as a Tiger mother and her studious son, while Arch’na, another high school mate, would be wearing a pink tutu. As for me, Wonder Woman socks were as far as I could go and still feel like a real runner. Paul’s fancy dress would be his Warren Street vest and racing shorts. Getting into the spirit of B2B just before heading into our corrals. Race preparation was perfect. As well as some relaxed runs in the park we had a great homemade pasta dinner (plus mussels, scampi and capresi salad!) on the eve, got plenty of sleep, woke up early (thanks to our bodies still being on East Coast time) and a smooth stress free lift to the start. We were in our corrals before 7am, over one hour before the scheduled 8am start. Homemade pasta and pesto was just one of the pre-race dishes. 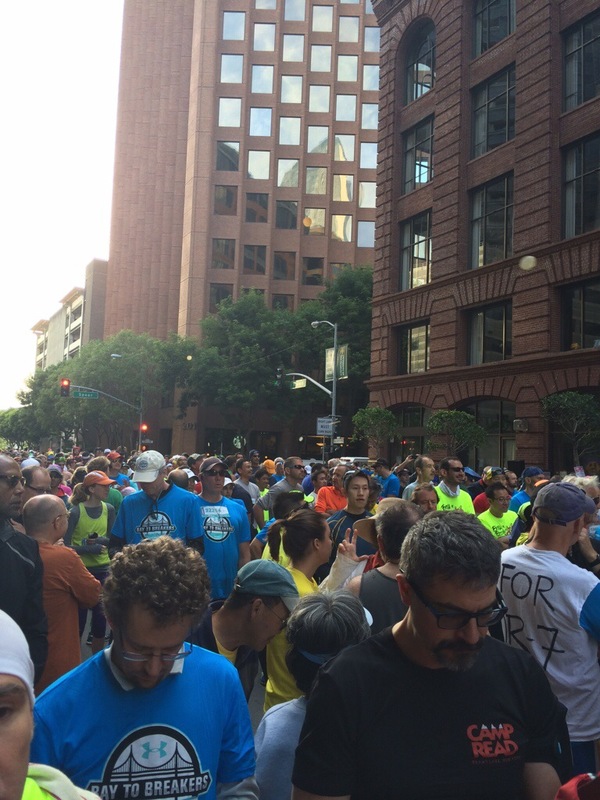 The corral, effectively a side street at right angles to the race start, had a great porta potty to runner ratio. No lines. In the corral I jogged up and down and did some strides. I spotted Sara Hall and a posse of elite Kenyan and Ethiopian runners. We got ushered to the start line at 7:45am. I was on the second row. And then we waited for the starter’s orders. 8am came and went. Some problem on the course. We waited and waited, my finger poised on the trigger, the start button on my Garmin. We even got to stride up and down the starting stretch. Then, at last we were ordered back to the start line. And we were off. At 8:24am! After barely a mile I was in the company of elite women, including Sara and Diane Johnson, and the first centipede. There were lots of extremely drunk spectators some who veered recklessly onto the course. Idiots. 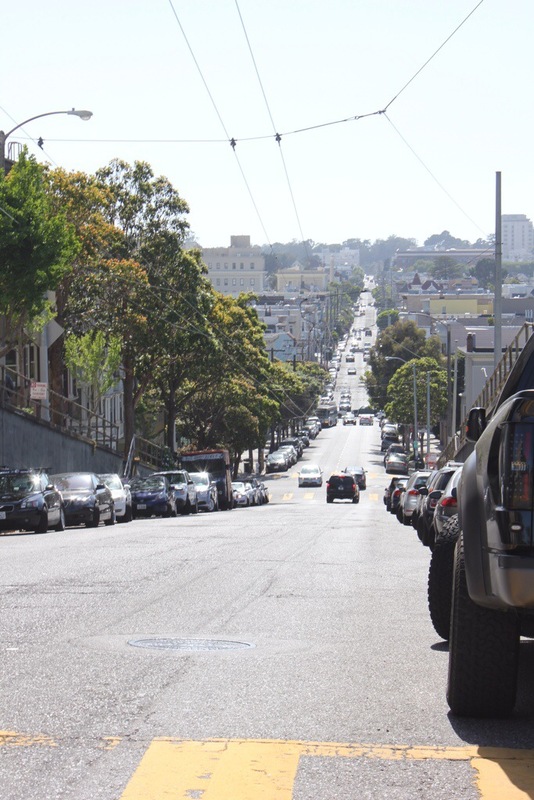 Bay to Breakers is part of running folklore for many reasons but for the more serious runners its Hayes Street Hill. 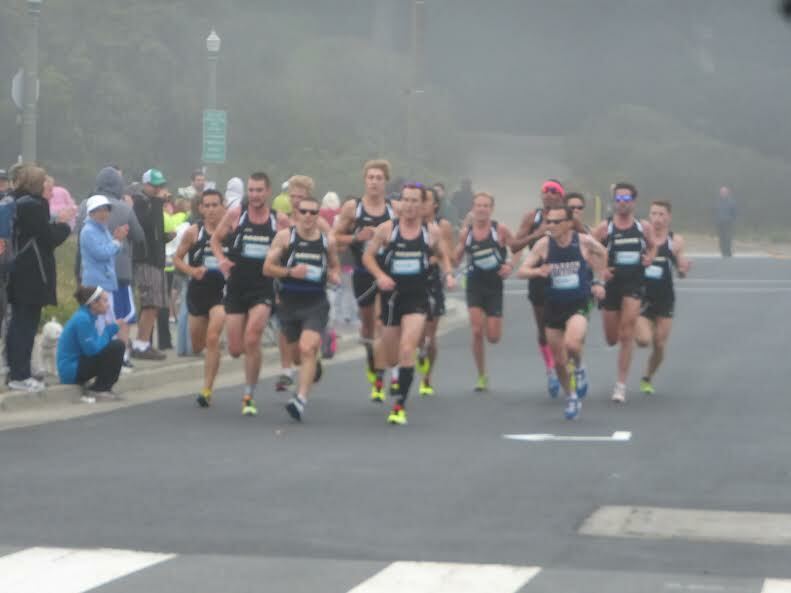 From sea level at the Embarcadero at around 2.5 miles the course rises steeply along Hayes Street Hill. It ominously looms into view barely a mile into the race. For 0.6 miles, five blocks from Fillmore to Steiner, runners climb an 11% grade to a summit around 260 feet above sea level. At each cross street it briefly levels off giving it a staircase type effect. I made my ascent with the lead centipede (at around 1:12 on this video clip). It was the toughest hill I’d tackled in a road race since the mid-90s. Thanks to timing mats at the base and summit the race results include splits for the climb. Mine was 3:22. 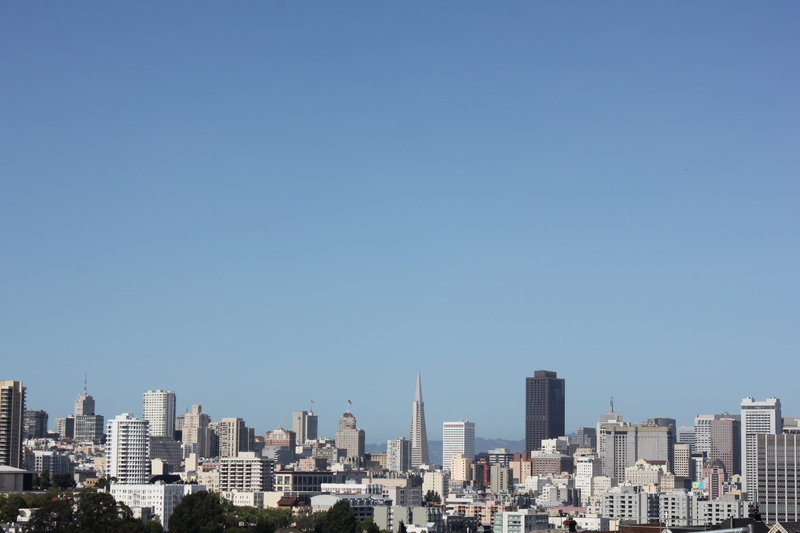 View from the top of Hayes Street hill. Once over the hill the remainder of the course, aside from a gentle uphill alongside the Panhandle, winds its way mostly downhill through Golden Gate Park. Hayes Hill slowed my mile split to 5:56 for mile 3. I was now in around 25th place and confident last year’s masters’ champ was behind me. My mile 4 split improved to around 5:30. I was feeling the hill and feared I’d climbed too fast. But as I entered the park I started to feel stronger and faster. And by the rime I hit the last few miles, which descend continuously, I was logging 5:11 miles. The first lady, Diane, passed me around mile 5. At mile 6 Sara, who said she found it harder than expected, also passed me. Approaching the windmill just before the final bend, some 200 meters from the finish line, I heard what sounded like a crowd just behind. Suddenly I had the lead centipede on my right shoulder taking the inside line of the bend. So as I raced to the tape, which I broke in 40:28 for 45th overall and first masters, I got overtaken by a 13 man centipede. My finish line pump fist was tempered by the realization that I’d been overtaken by so many so close to the finish. And they were all tied together. The day after the race I ‘recovered’ by running from Sham’s sister Annabel’s apartment in Emeryville along the Berkeley shore. At the time of writing I am still waiting for the $1,000 check for first place masters. Paul trying to outrun the first centipede team and the fog. Unlike Paul who was in a spacious seeded corral, I was hemmed in with the 8 – 10 minute runners and not a porta potty in sight. I was in the second row from the start of my corral which would set off five minutes after the elite and seeded runners. Watching people throw tortillas in the air, as is the tradition at B2B,was mildly entertaining until one hit me on the back of the head. After standing around waiting for more than an hour for the race to begin, I was actually looking forward to running the race! Anything to get out of that crowded corral. Can you spot the flying tortillas in this photo? I knew that I needed to make sure I didn’t go too fast in the first two miles. 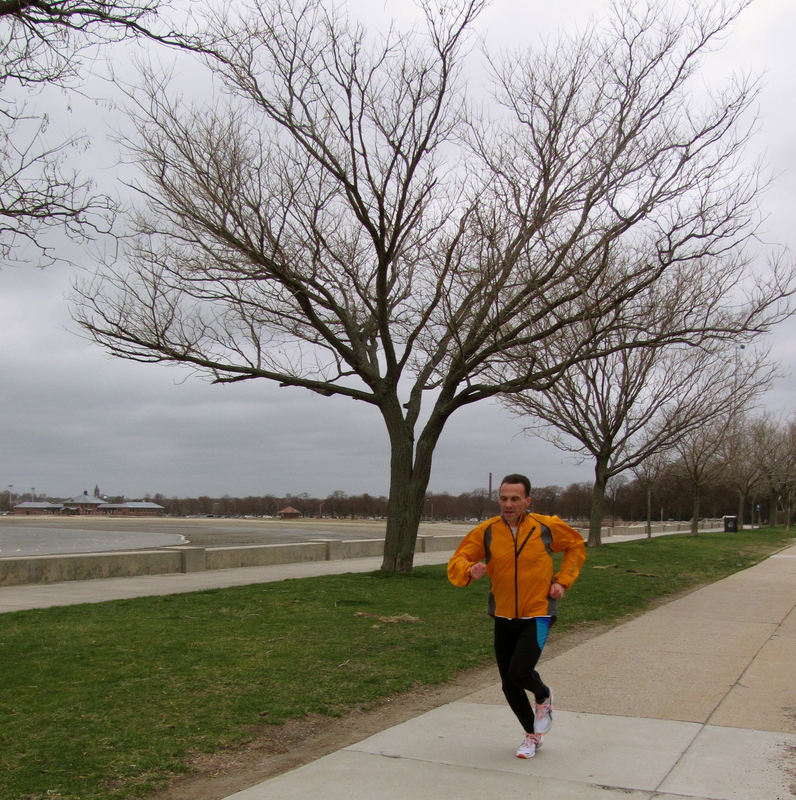 I aimed to start out at around 9 minute mile pace and then up the ante to 8:30 pace. All was going well until about half a mile into the race I literally ran into a huge crowd of rowdy, costumed revelers who were all over the road. Those taking the race seriously quickly moved to the far right side. It took some effort but I managed to block out the antics of the party crowd that had invaded the race and focused on the hill that I knew was imminent. If I wanted a decent finish time I had to avoid Hayes Street Hill slowing me down too much. As I approach to the hiill is daunting. It’s five blocks of steady climbing with the last two blocks of a steepness we don’t see in New York. I began my trudge up the hill determined to try and keep to a decent tempo. I was surprised to find myself passing runners. The last two blocks were hard but I didn’t feel I had to stop. It was my slowest mile but not as slow as it could have been! I got up in 5:18:19 and according to the results I was the 15 fastest female in my age division up that hill! 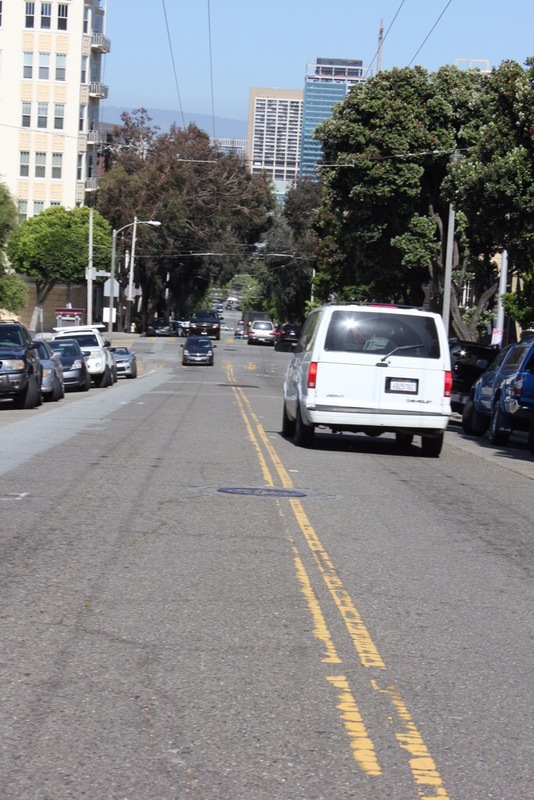 Here’s the downhill right after the top of Hayes Street hill. I had been looking forward to the downhill immediately after Hayes Street Hill summit but while it was faster down than up it was not easy getting back to target pace. As I came towards the park I was thankful that I’d done that run with Lilian so that I had an idea of what was ahead – fortunately mostly downhill with just one slight rise. Entering the park there was a fog sitting above us and green on both sides. It felt almost enjoyable. Until I looked at my watch and found I still had three miles to go. But I was back on target pace and hungry for that finish line. Lilian and Peter close to the finish. Photo credit to Scott who had to do a 100m dash to get this photo! This race has a great finish. Downhill with the ocean stretching out on the left. I came round the final corner with 200 metres to go and heard Paul’s voice. He had had enough time to pick up his medal, get some snacks and come out to cheer me on. I was pleased to still be feeling relatively strong as I crossed the finish line. I had been hoping for about 1:10 at best but managed to finish in 1:04:19 at 8.37 pace. I was 19 out of 1392 women in my age group. Not Speedy Gonzales but it seems like I’m getting faster as I get older. Lilian and Peter finished the race in a time close to what they were hoping for. 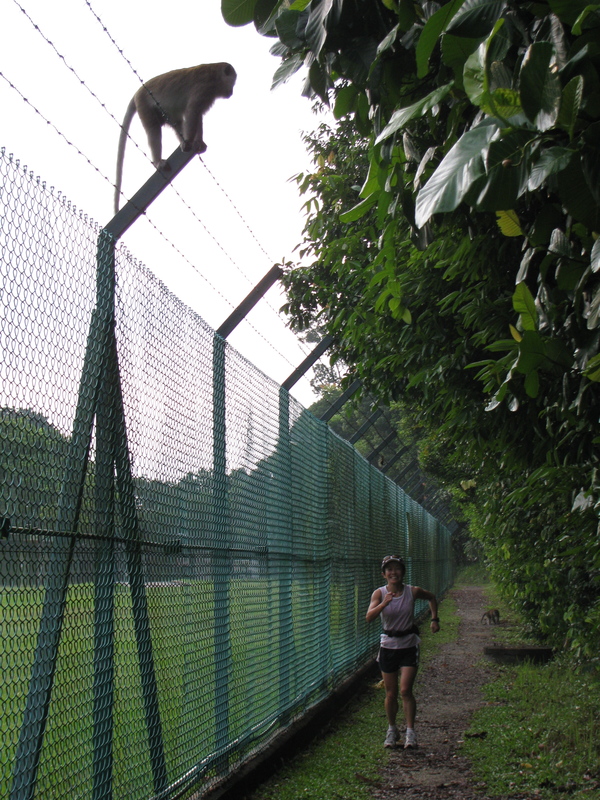 Meanwhile Arch’na, who walked most of the course, saw a lot more of the whacky side of this race than the rest of us. Post race celebrations involved champagne, cheese and burgers which were all eaten with relish. The day after the race while Paul went for a run I decided a walk in Muir Woods was be enough for me. My first race race that required an air ticket turned out to be a lot more fun than I expected! 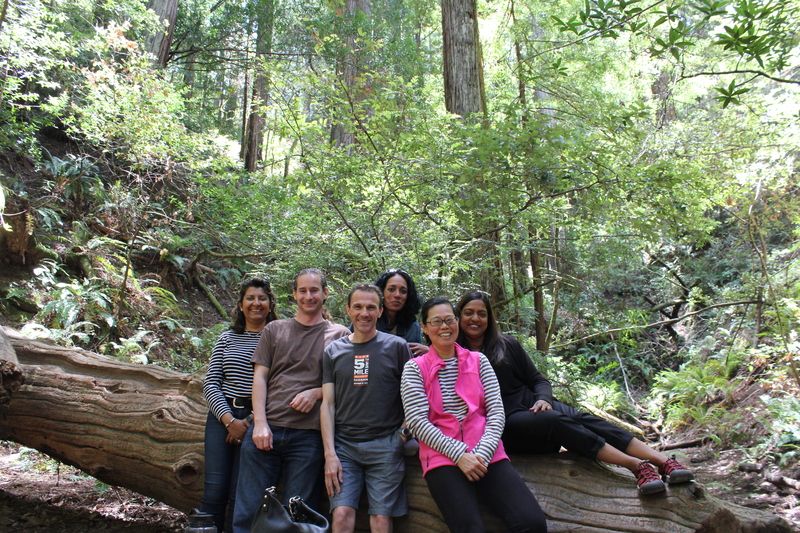 Post-race activity involved a walk in Muir woods with those of us who had done the race and my sister Annabel and her boyfriend, Keith. 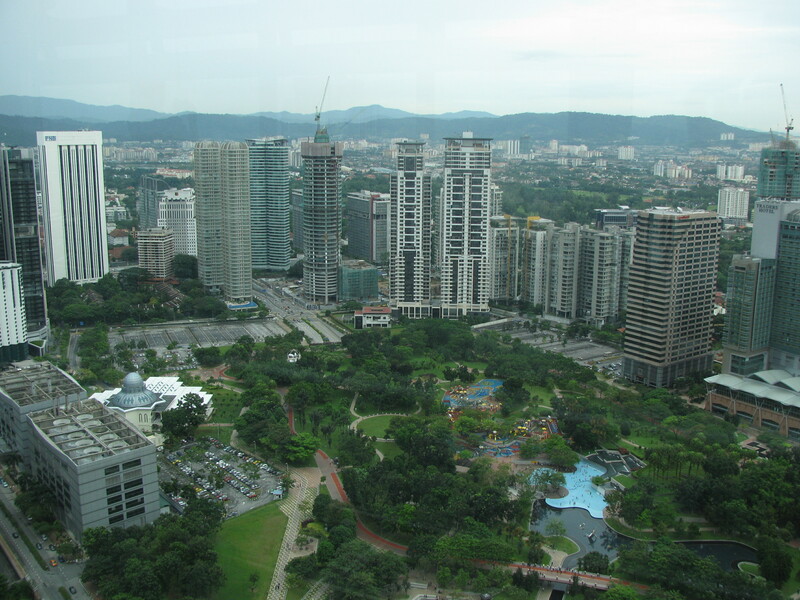 What Makes a Good Running City? Sidewalks: Broad, uncrowded sidewalks (or pavements as I call them) or cycle routes are key in cities. Running on roads present too big a risk. I’ve run in cities like Jakarta and Bangalore where the sidewalks are an obtacle course of vendors, or animals or both, and potholes. Manhattan’s sidewalks are often clogged up with pedestrians: avoid streets with lots of shops like 5th Avenue (Park Avenue is best) or take to the East River Greenway or Hudson River Greenway. 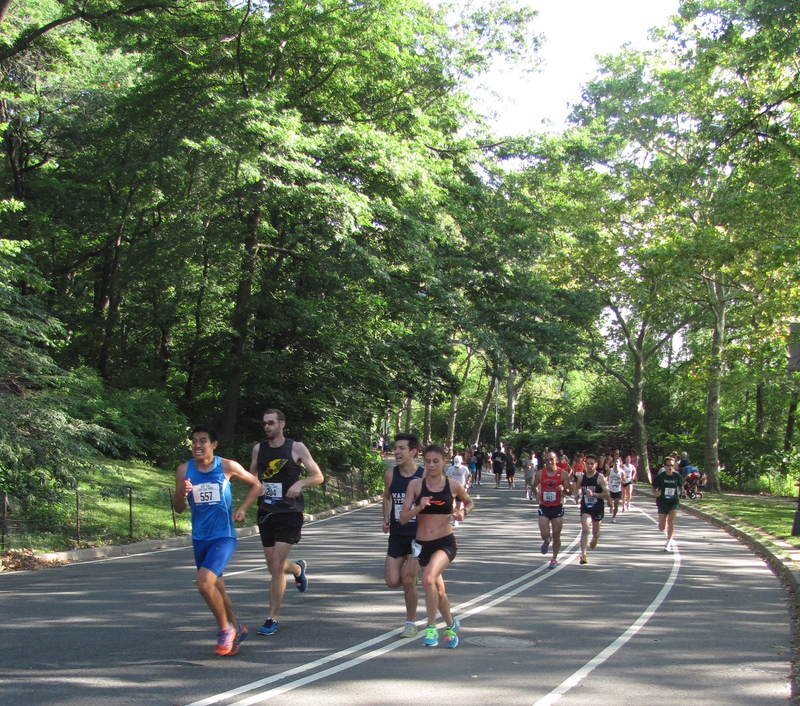 Lots of races take place in Central Park throughout the year. 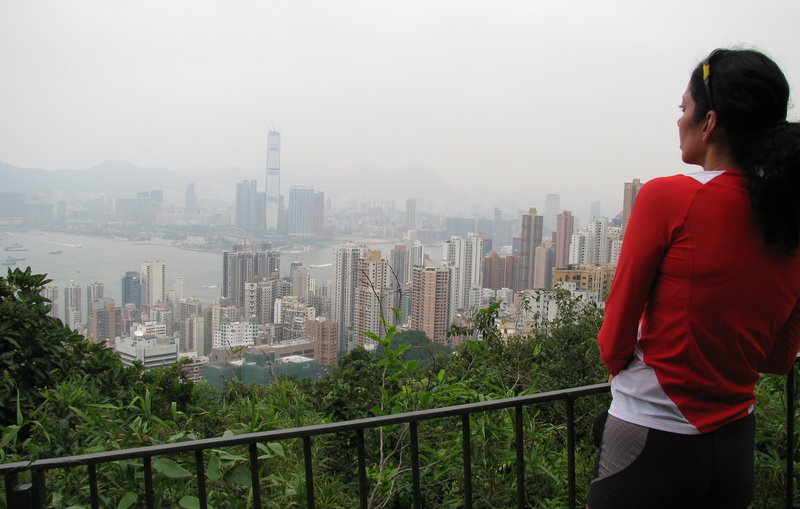 The view from Victoria Peak in Hong Kong is worth the hilly run to get there. Paul being blown about on a run in Boston in April 2011. 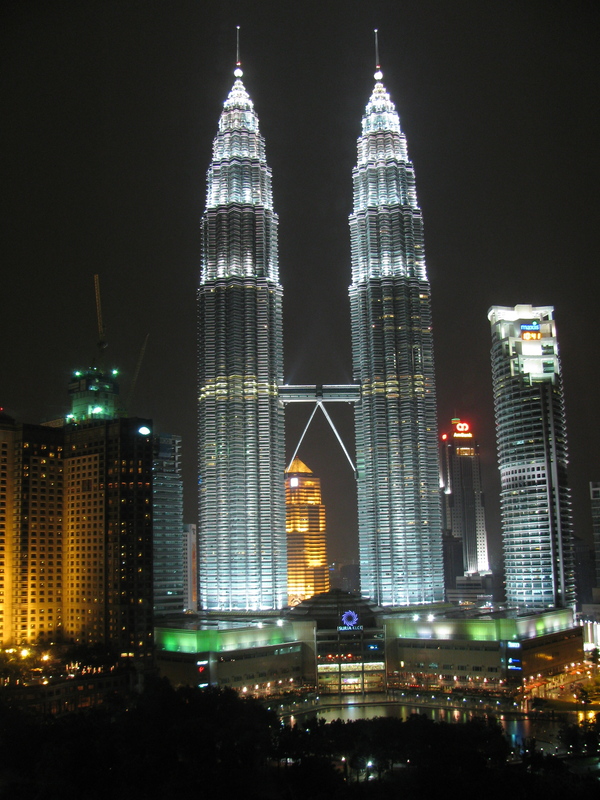 Bodies of Water: I like water so cities with canals, lakes, rivers, sea-fronts are more likely to get my vote. Paths around West Lake in Hanoi and along the Mekong River in Phnom Penh allow for enjoyable runs in not so runner-friendly cities. 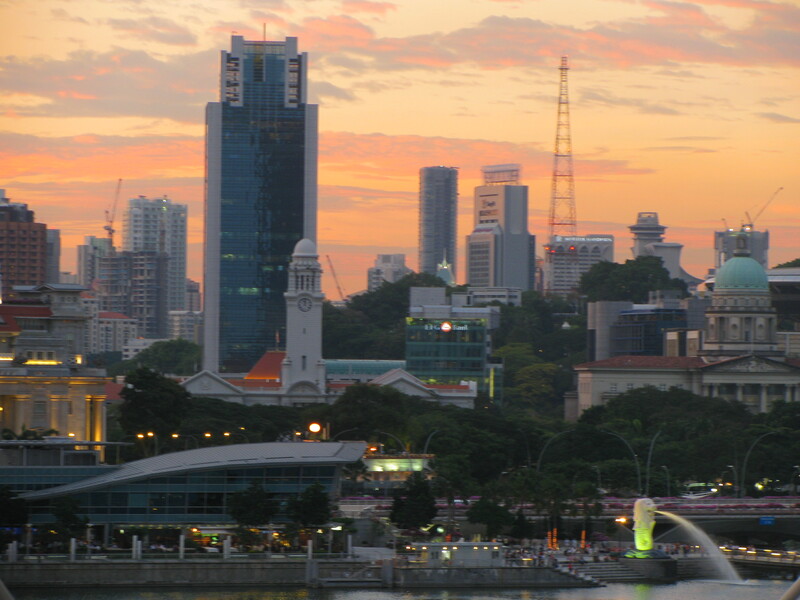 And in my home country, Singapore, running through the Esplanade Park reveals views of the Singapore River set against the ever-changing Singapore cityscape. 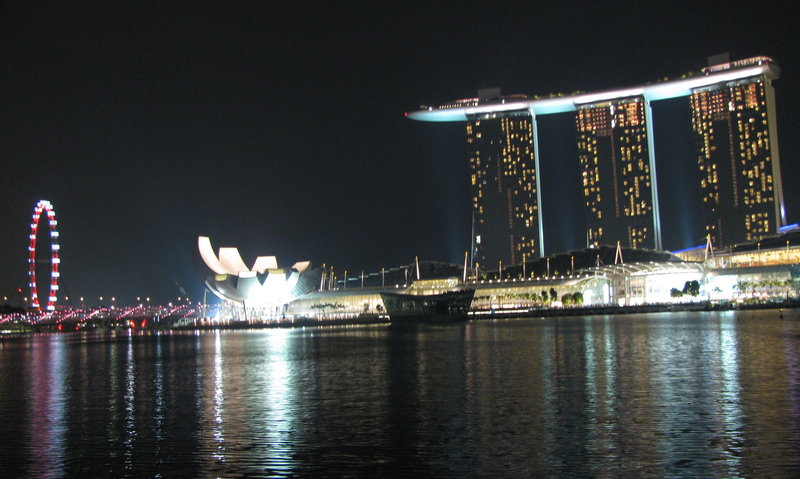 The Singapore skyline with its mix of old and new buildings.